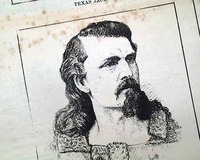 The term "wild west" conjures many things in the mind—criminal outlaws like Billy the Kid or Jesse James, the California Gold Rush, or the folklore associated with the American frontier. 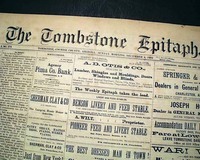 We welcome you to browse our Wild West newspaper inventory or learn more about American Wild West newspapers at our main Wild West page. 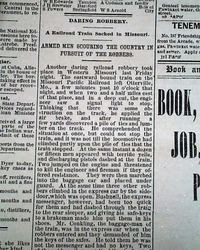 BISBEE EVENING MINER, Arizona (Territory), May 8, 1907 A territorial newspaper from just above the border with Mexico, as Arizona did not join the Union until 1912. 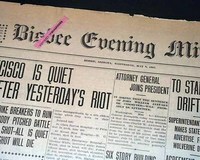 Among the front page headlines: "SAN FRANCISCO IS QUIET AFTER YESTERDAY'S RIOT" "Six Story Building Collapses In Omaha" & much more. 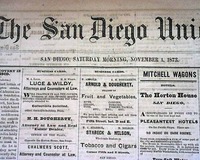 SAN DIEGO DAILY UNION, San Diego CA, November 1, 1873. 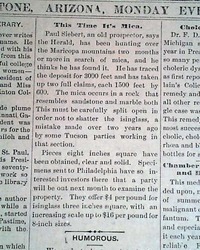 At one time this was a large mining town, larger than San Francisco. Now it is a ghost town and a much visited state park. 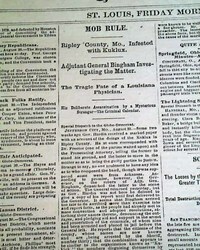 This issue was published from during its hay-day. 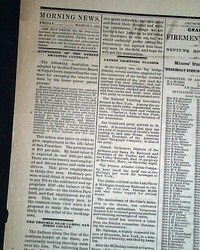 BOSTON EVENING TRANSCRIPT, July 22, 1881 The ftpg. 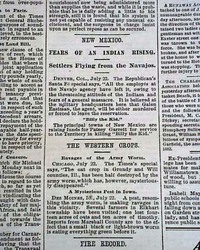 has a brief item under; "New Mexico" a subhead: "Billy the Kid" noting: "The principal towns of New Mexico are raising funds for Patsey (sic) Garrett for services to the Territory in killing 'Billy the Kid'. " 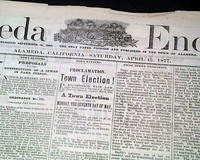 Complete in 8 pages, a few archival mends inside, good condition. 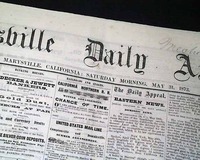 MARYSVILLE DAILY APPEAL, California, May 31, 1873 The front page has over 2 1/2 columns taken up with reports on the Modoc Indian War with the heading; "The Lava Beds" and subheads: "Their History, Location and Character--How They Look from the Signal Station--Among the Caves--View of Captain Jack's Lair". 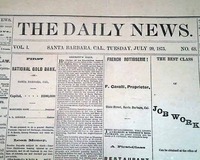 THE DAILY NEWS, Santa Barbara, California, July 20, 1875 Uncommon from this famous town, and a volume 1 issue. 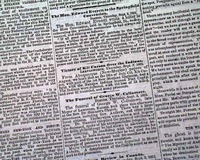 Various news & ads of the day, four pages, great condition. "#88" inked in the upper corner. 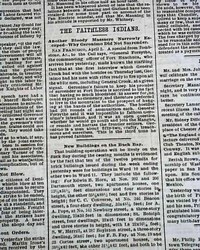 GUNNISON REVIEW-PRESS, Colorado, Feb. 12, 1884 An uncommon title from this boom mining town in the southwestern quadrant of Colorado tucked in a valley amidst the Rocky Mountains. 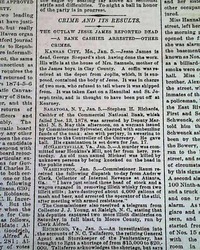 Gunnison boomed in the late 1870's and early 1880's and was once the home of Wyatt Earp and "Texas Jack". Today there are some 5500 residents of Gunnison. 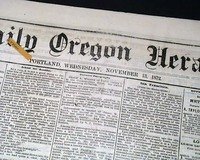 DAILY OREGON HERALD, Portland, Nov. 13, 1872 An early issue from the Northwest just 13 years after gaining statehood. 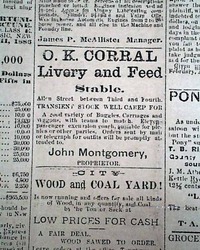 Various news of the day from both the area and the nation, with a great wealth of advertisements, many of which are illustrated. 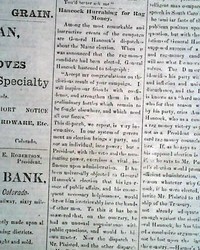 Four pages, never bound nor trimmed, nice condition. 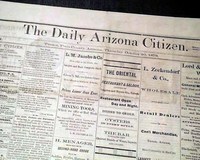 ARIZONA DAILY GAZETTE, Phoenix, Nov. 9, 1893 This issue is from the Arizona Territory, 19 years before it joined the Union. 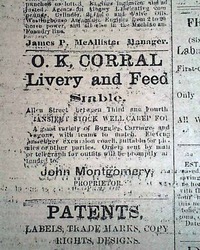 Varied news reports both local & national with a nice wealth of ads as well, many of which are illustrated. 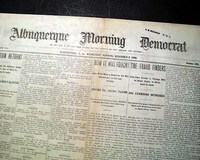 Among the articles: "A Peculiar Find - A Box Full of Dynamite Found" Eight pages, nice condition. 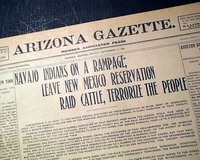 ARIZONA GAZETTE, Phoenix, Sept. 17, 1906 Perhaps not unexpected from territorial Arizona (statehood in 1912) but later than one would expect: "NAVAJO INDIANS ON A RAMPAGE; LEAVE NEW MEXICO RESERVATION RAID CATTLE, TERRORIZE THE PEOPLE" . 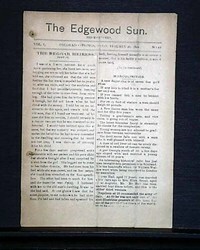 Eight pages, irregular at the blank spine, good condition. 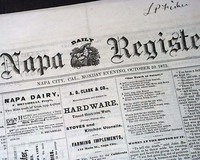 This is a small town north of the San Francisco Bay area. 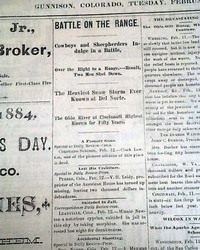 The front page features a chapter from the serialized "Treasure Island, by Robert L. Stevenson", with a front page illustration from the book as well. 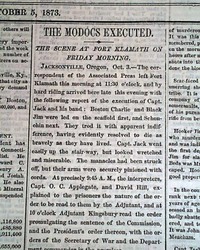 It first appeared in book form just 5 years previous. 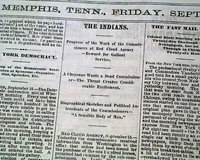 MEMPHIS DAILY APPEAL, Tennessee, Sept. 17, 1875 The top of a ftpg. 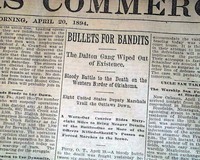 middle column has heads: "THE INDIANS" "Progress f the Work o the Commissioners at Red Cloud Agency--Reward for Gallant Service" "A Cheyenne Wants a Dead Commissioner--The Threat Creates Considerable Excitement". 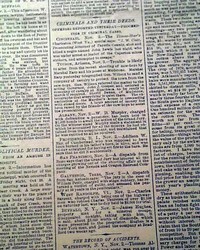 The text takes nearly an entire column. 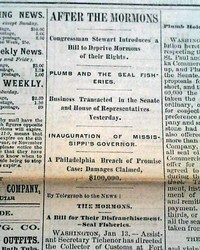 Quite early from Washington, and 16 years before it became a state! 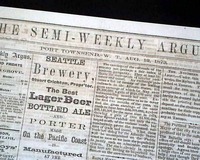 Half of the front page is taken up with ads including one for the "Seattle Brewery". 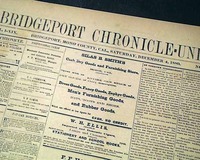 with news on pages 1 & 2. 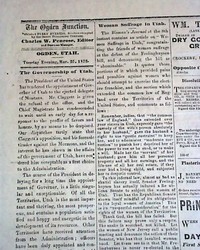 The subtitle in the masthead notes: "Devoted To The Leading Interests of California and the Pacific Coast". 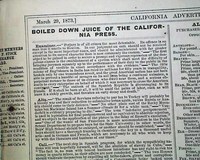 The content is varied and includes a wide range of ads as well. 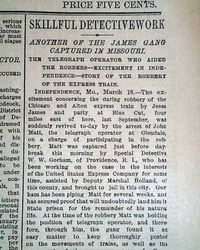 * Jesse James killed ? 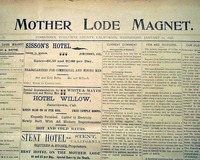 A very rare title from this town very high in the mountains near the Nevada border. 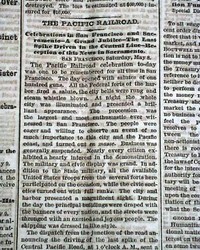 Today it is a tourist-focused community. 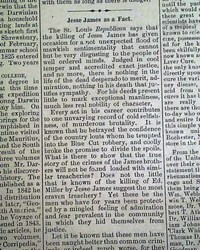 Gregory (Union List of American Serials) notes that only two institutions have ANY issues of this title, one of which has this issue. 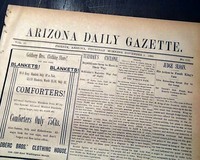 This issue is from the Arizona Territory, 19 years before it joined the Union. 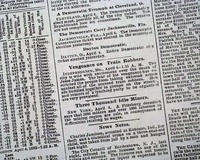 Varied news reports both local & national with a nice wealth of ads as well, many of which are illustrated. 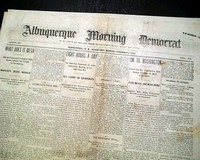 Actually a territorial newspaper as New Mexico did not become a state until 1912. 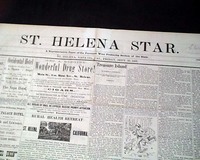 Eight pages, typical news & ads of the day, very nice condition. 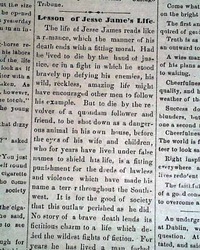 THE RIVER FALLS JOURNAL, Wisconsin, May 4, 1882 Page 3 has: "Jesse James As A Fact" is not kind to him, including: "...that the killing of Jesse James has given occasion for a not unexpected flood of mawkish sentimentality that cannot but be very disgusting...Every act in his career contributes to one unvarying record of cold selfishness, of murderous brutality...". 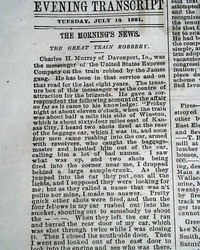 A quite scarce title, in fact the first we have discovered. 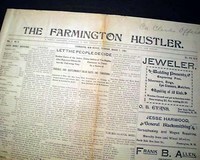 This lasted but two years before merging with the Times to become the "Farmington Times-Hustler". 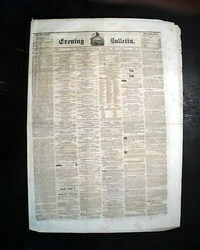 "Union List Of Serials" notes that no institution in the country has any issues from this year. 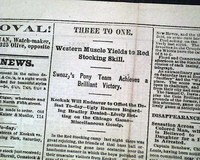 ST. LOUIS GLOBE-DEMOCRAT, May 22, 1875 Near the top of the back pagte is; "THREE TO ONE" "Western Muscle Yields to Red Stocking Skill" "Sweazy's Pony Team Achieves a Brilliant Victory" which is a quite lengthy & detailed baseball game report taking an entire column. Many years ago we had a reasonable inventory of this title, but today this is one of our last. 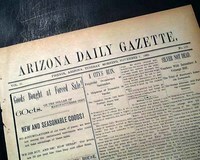 And it is a volume one issue from the Territory of Arizona as it did not become a state until 1912. 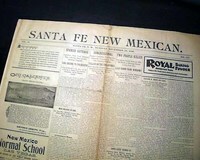 Actually a territorial newspaper as New Mexico did not become a state until 1912. 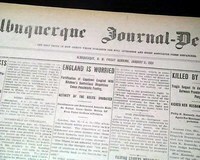 We've offered a number of titles from Albuquerque but this (and a few others) is the first of this title to come into our inventory.